It is true, however, that contemplative practice - not quietism though - is a recommendable part of our spiritual life, but it is not an all embracing rule. Among the great Saints we find not only the contemplative Fathers of the desert and seclusion, but also many warriors, benefactors, missionaries, sacred writers, sacred artists, and other persons of great activities and a sacrificial mode of Christian life. And what is our answer to the atheists who call our mystical Faith superstition? Least of all they have the right to call it superstition since, by denying God and the soul and all the higher intelligences, they are indeed bearers of a thoughtless and nefarious superstition which never existed in the history of mankind, at least not on such a scale and with such fanaticism. Now, while those who speak of our mysticism are unable to give a satisfactory explanation of this word, let us ourselves look to it and explain to them from our point of view how should they understand our so-called mysticism. Our religious mysticism is nothing misty, nothing nebulous, nothing obscure or mystified. It is our clear and perennial doctrine of causality. If we have to call this doctrine by an ism, we may call it personalism. Every day and everywhere people talk of causes. They say: “This is caused by that, and that is caused by this.” That is to say: the next preceding thing, or event, or fact, or accident is the cause of the next succeeding one. This is indeed a superficial and shortsighted notion of causality. We don’t wonder about this superficiality of some ignorant persons, especially of the busy people of great cities who have little time for deep and calm thinking. But we are astonished to find the same superficiality with the learned and philosophically minded, as the materialists, naturalists and even deists. And because we call their theory of causes naive and fatalistic, they call us mystics. We consider that all those persons be they ignorant or learned, who believe in natural and physical causes as definite, are fatalists. Both naturalism and materialism are teaching a blind fatalism without a smallest door of escape or a smallest window for sunshine. We Orthodox Christians must resist this blind fatalism, as all Christians should do, and defend our intelligent doctrine of personal causality of and in the world. This doctrine means that all causes are personal. Not only the first cause of the world is personal (as the deists think), but personal are all the causes of all things, of all facts, of all happenings and changes in all the world. When we say personal, we mean intelligent, conscious and intentional. Yea, we mean that some sort of personal beings are causing all, or better to say, are the causes of all. That is what personal means. I know that at this my first statement some non-Orthodox would remark: “That doctrine you are probably drawing from your copious Orthodox tradition, for which we do not care, and not from Holy Scripture, which we take as the only infallible source of all truths.” To this I answer: no, not at all; this doctrine is so evident in Holy Scripture, from the first page to the last, that I have no need this time to quote our tradition at all. On the first pages of the sacred Bible a personal God is specified as the First Cause, or better to say the First Causer of the world visible and invisible. That God the Creator is personal, this is a professed and upheld dogma not only by all Christian denominations, but by some other religions too. We Christians, however, are privileged to know the inner being of God, i.e., God as Trinity in persons and Oneness in essence. We have learned to know this mystery through the momentous revelation in the New Testament. The dogma of the Father and the Son and the Holy Spirit means that God is trebly personally, yea supremely personal. But not God alone is personal. Personal are also the angels, personal is Satan with his perverse hosts of demons, and finally personal are men. If you carefully read the Bible, without the prejudices of so-called “natural laws” and the supposed “accidental causes”, you will find three causal factors, and all three are personal. They are: God, Satan and Man. They are, of course, not equal in personal attributes, and there is no parity among them. Satan has lost all his positive attributes of an angel of light, and has become the chief enemy of God and Man, but still he has remained a personal being, bent though to do evil. Man, since the original sin, has darkened his glory and deformed God’s image in himself; yet, he has remained a personal being, conscious, intelligent and purposefully active, wavering between God and Satan, with his free choice to be saved by the first or destroyed by the second. 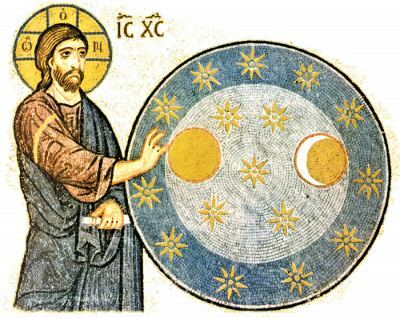 affirms that God is not only the First Causer of the world but also that He is all the time the personal Almighty – Pantokrator – of the world, as we confirm in the first article of our Creed. Another causal factor is Satan, God’s adversary, with his hosts of fallen spirits. He is the personal causer of all evil. Ever since his fall as Lucifer from the glory of “an anointed cherub” (Ez. 28) (Isa. 14) to the dark pit of Hell, he is unceasingly trying to infiltrate evil and corruption into every part of God’s creation, specially into man. Envious of God and man, he is the hater of both. Christ called him “a murderer from the beginning” (John 8.44) and also “a liar and the father of it”. He is a mighty ruler of evil and darkness, but still subordinate, unwillingly though, to the all powerful God. Only with God’s permission he is able to harm men and to cause illness, confusion, pain, discord, death and destruction. But the more a person or a people sin against God, the greater power Satan gets over that person or that people. At the Advent of our Lord Jesus Christ the whole world was lying in evil because of Satan’s terrible grasp over the bedeviled mankind. The world then was teeming with evil spirits as never before. Therefore, Satan dared to offer Christ all the kingdoms of the world and the glory of them as his own. A robber and liar! The third causal factor in this world, according to the Bible, is man. With all his littleness and weaknesses man is the greatest prize for which Satan is relentlessly and desperately fighting, and for which God from the beginning was ready to die. Staggering between God and Satan, man is supported by God and beguiled by Satan, vacillating hither and thither, groping for light, life and happiness in his short span of existence on this planet. Yet, with all his seeming insignificance in this mammoth universe, man is able to change it by his conduct. Confucius said: “The clouds give the rain or give it not according to men’s conduct”. Much more valid is this observation in Christianity with its belief in a personal God, the Giver of rain. By his faith and virtues, specially by his obedience to God, man regains the dominion over all the created nature as God in creating him entrusted to him. But by his apostasy and corruption he dethrones himself and comes under the dominion of physical nature and becomes its slave. Instead of commanding he is obeying mute nature, and fighting it for his mere existence, as you see it still now happening in our own generation. And instead of having God as his only Master, he got two masters over himself, Satan and nature, both tyrannizing him. By his faith and virtue, man could have removed the mountains, tamed the wild beasts, defeated the aggressor, shut the heavens, stopped calamities, healed the sick, raised the dead. And by his sins and vices, specifically by his apostasy from God, his only loving and powerful Friend, he could have caused the destruction of cities and civilizations, the earthquakes, floods, pestilence, eclipse of the sun, famine and all the innumerable evils, pleasing Satan and saddening God. Thus, following God, man becomes god, and following the devil, he becomes devil. But be he with God or with God’s adversary, man has been from the beginning and is now the focal point of this planet and one of the three most important causes of events and changes in the world. And thus, whatever happens on this world’s stage, it happens either by God’s benevolent will, or by Satan’s evil will, or by man through his free choice between good and evil, right and wrong. Now, when we mention only these three causal factors: God, Satan and Man, you should not think of a mere three persons, but of terrific forces behind each of them. Behind God are a numberless host of angels of light, so much so that each man and nation have their own guardian angel; behind Satan are a horrible locust of evil spirits, so much so that a whole legion of them are used to torment one single man, like that one of Gadara; behind Man, since Christ’s emptying the Hades and His Resurrection, there are by now billions of human souls who from the other world, from the Church Triumphant, by their intercession and love, are helping us, many millions of Christ’s faithful, still fighting against the satanic forces for Christ and our own salvation. For our chief fight in this world is not against natural and physical adversities which is comparably a small fight befitting more animals than men, but as the visionary Paul says, it is “against principalities, against powers, against the rulers of the darkness of this world” (Eph. 6.12), i.e., the satanic forces of evil. And we Christians have been, and always shall be, victorious over these satanic forces through Jesus Christ our Savior. Why through Him? Because love is a greater power than all other powers, visible and invisible. And Christ came to the earth and went down below to the very hellish nest of the satanic hosts to crush them in order to liberate and save men for sheer love for mankind. For this reason, at the end of His victorious mission, He could say: “All power is given unto me in heaven and in earth” (Mt. 28:18). When He says "all power", He means literally "all power": in the first place the power over Satan and his satanic forces; then the power over sinners, sin and death. Satan is the causer of sin and death: “For this purpose the Son of God was manifested, that He might destroy the works of the devil” (1 John 3:8). Therefore, we rejoice in our belief that our Lord Jesus Christ is the irresistible Lord. We are acknowledging this belief in every liturgy by stamping the sacred bread for the Holy Communion with the words IC XC NIKA (Jesus Christ Conquers). Read and reread the Gospel as much as you like, and you will find in Christ’s words not a slightest suggestion of natural and physical causes of anything and any happening. Clear as the shining sun is Christ’s revelation and teaching, that there are only three causal factors in this world: God, Man and Satan. At the same time, Christ's chief obedience was to His heavenly Father; His chief loving work was the healing of men’s bodies and souls, and His chief dispute with the Pharisees was about His power of driving the evil spirits out of men and the forgiving of sins. As to the nature and so-called natural order and laws, He has showed unheard of absolute dominion and power. He vigorously impressed His followers that they “were not of the world”, but, said He, “I have chosen you out of the world” (John 15:19). Now, since Christians are not of this world, they certainly cannot accept the theory of the men of this world about the impersonal, unintelligent and accidental causes of the process of things and events. Also in our liturgical book you find the same three personal causal factors as in the Gospel. The same in the Lives of the Saints too. The same in the conviction and consciousness of the masses of our Orthodox people. Therefore, whoever speaks of impersonal causes of things, happenings and changes in this world, is limiting God’s power, ignoring the powers of darkness, and despising the role and significance of man. Scripture does not know, and does not mention any impersonal and blindly accidental cause of anything in the world. The Bible teaches us quite clearly, that the causes of all things, facts, happenings and changes, come from higher personal beings and personal intelligences. And we stick to this teaching of the Holy Book. Therefore we make no concessions to the secular, or scientific theories about impersonal, unintelligent, unintentional or accidental causality in the world. When I say we, I do not think only of the great Fathers of the Church, nor of the Doctors of Divinity, nor of the learned teachers of religion, but also of the masses of our Orthodox people all over the world. 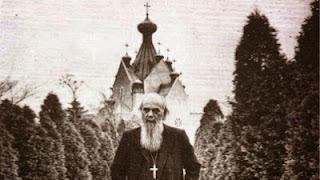 Our Orthodox people would not say: a wolf caused the death of somebody’s sheep; nor a falling stone caused the injury of a boy; nor a tornado was the cause of the destruction of somebody’s house; nor good weather was the cause of an abundant crop. Our people look through the screen of the physical world into a spiritual sphere and there seek the true causes of those happenings. They always seek a personal cause, or causes. And though this is in accord with the Bible’s teaching, some outsiders call us mystics, and our Faith mysticism or superstition. In fact, our mysticism is nothing else but a deeper insight into spiritual realities, or intelligences, which are personally causing whatever there is or happens, using the natural things and elements only as their instruments, tools, channels, symbols, or signals. All this leads us to the following conclusions: First of all, Christianity is a religion not so much of principles, rules and precepts, but primarily and above all of personal attachments, in the first place an affectionate attachment to the person of our Lord Jesus Christ, and through Him to other members of His Church, the living and the dead. Secondly, our Orthodox doctrine of personal causality on the whole range of nature and the world’s history is beyond any doubts the biblical doctrine. It was wholly adopted and explained by the Fathers of the Church, and it is kept lucidly in the consciousness of the Orthodox people. The benefits we are drawing from such personalism in the doctrine of causality are manifold. By it we are stirring our mind to pierce through the visible events into the realm of invisible intelligences causing and dominating all the drama of the world. It sharpens more than anything else our thinking power, our own intelligence. By it we are constantly aware of the presence of our Friend, Christ the Savior, to whom we are praying, and also of our archenemy, Satan, whom we have to fight and avoid. It helps us enormously toward educating and forming the strong personal, or individual, characters. It inspires us with a spirit of optimistic heroism in suffering, self-sacrificing, and in enduring martyrdom for Christ’s sake beyond description, as testified by our Church history. All these and other benefits do not possess the follower of the doctrine of impersonal causality; not even the greatest of all benefits - the knowledge of the truth.